Visitors to the Myrtle Beach are come here for the sun, salt, and sand. Though the beach is a great part of our area, one can’t discount the variety of other attractions and events that the Grand Strand has to offer, including our eclectic music scene. There are tons of great places to enjoy live music in the area and performers of all genres. Whether you are looking for a family friendly outing or something that the adults can enjoy, you are sure to find exactly what you are looking for without traveling far. Enjoy our roundup of the best places to catch live music in Myrtle Beach and make sure you catch a show on your next Myrtle Beach vacation! Often touted as the “live music headquarter” of the Grand Strand, the Myrtle Beach House of Blues is THE place to catch live music of many forms. The indoor stage is known for attracting a wide array of talent including many national acts like Corey Smith, Old Crow Medicine Show, Hootie and the Blowfish, AWOL nation, and Dave Chappelle – to name a few. Additionally, the outdoor deck hosts live local bands throughout the week and hosts several festivals through the year. Call (843) 272-3000 for more information. A short drive south to Murrells Inlet is well worth the trip for lovers of great food and great entertainment. As the name suggests, the Murrells Inlet MarshWalk is situated waterfront in the seafood capital of the state. The inlet-front boardwalk connects nine unique restaurants, most of which offer plenty of live entertainment through the warmer months. MarshWalk is the perfect place to immerse oneself with the locals and enjoy true local talent. Conveniently located in the heart of Myrtle Beach, Palace Theatre is a popular live entertainment spot for families. Shows here vary seasonally and include Hot Jersey Nights, a tribute to the Frankie Valli and the Four Seasons, and Carnival of Magic, a brand new show for 2015 that features Peter Gossamer (house magician) and several special performers from America’s Got Talent. Additionally, Palace Theatre is home to several other tribute shows and special performances, like Cinderella, The Nutcracker, and The Beatles Tribute – to name a few. Interested guests can call (843) 448-9224 for more information. Get up close and personal with your favorite performers of the past at Legends in Concert! This one-of-a-kind show features five different musical artists from different time periods and genres – ensuring a great time for everyone involved. The talented tribute artists are even decked from head to toe in colorful costumes and makeup to provide a truly remarkable resemblance to the performer they are portraying. Though tributes vary seasonally, this season will include guests like Elvis, Buddy Holly, Prince, Diana Ross, Dolly Parton, the Blues Brothers, Rod Steward, and more! Call (843) 238-7827 for more information. If you are looking for one show to please everyone in your group, look no farther than the Alabama Theatre! The featured show of the summer is “One The Show” which combines a wide array of musical talent and comedy acts into one grand performance. Country, pop, gospel, rock, and comedy are all represented with colorful costumes and expert choreography to create a truly unique experience. This show is perfect for families and appropriate for guests of all ages. Call (843) 272-1111 for more information. Variety is the spice of life at the Carolina Opry; with five unique shows to choose from you might have a hard time picking just one! Offerings include The Carolina Opry (a family favorite for almost 30 years), Time Warp (a musical celebration of the 60’s, 70’s, and 80’s), Thunder and Light (a music, dance, and laser light show), Light (a one-of-a-kind laser light show), and The Carolina Opry Christmas Special (only offered November – December). Show times vary throughout the year; call (800) 843-6779 for more information. Take a trip back in time at Medieval Times Dinner and Show! This epic performance showcases unbelievable live action jousting competitions and sword fights in addition to awe-inspiring horsemanship and falconry. Guests sit ringside and are served a four-course meal fit for a king as the show takes place right before your eyes. The menu includes tomato bisque, garlic bread, roast chicken with herb-roasted potato and buttered corn on the cobb, and a fresh baked fruit pastry. Call (843) 543-9637 for information and tickets. Ahoy mateys – get ready for a swashbuckling good time at Pirates Voyage! This live action adventure features colorful costumes and impressive acrobatics as the sapphire and crimson pirates battle it out to see who will win the rights to the lost treasure. The show includes a decadent multi-course meal in addition to the acrobatic feats, on-deck battles, and live animal appearances. Dinner includes creamy vegetable soup, house biscuit, roast chicken and pulled pork, buttered corn on the cobb, herb roasted potato, and a homemade apple pie. Call (843) 497-9700 for information and tickets. Enjoy fantastic food and an eclectic mix of both traditional and contemporary gospel tunes at the House of Blues Gospel Brunch. A favorite among both visitors and locals alike, this weekly event takes place each Sunday from 10:30am – 1:30pm and showcases the work of Kirk Franklin, a nationally renowned gospel director. Brunch includes an upscale buffet that offers all of your breakfast and lunch favorites, including the now famous chicken and waffles. Call (843) 272-3000 to save your spot! 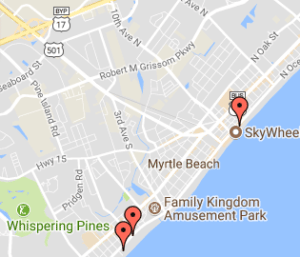 Where is your favorite spot in Myrtle Beach to catch live entertainment? Let us know!